All our 36 inch Table Runners, in cotton, burlap, and jute fabric, in all themes including farmhouse, country, primitive, cabin/lodge, beach, Christmas, and more! 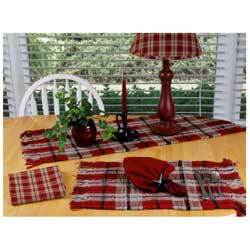 Many have matching placemats and other home decor items. Memories of decorating gingerbread men, piping sugar cookies, and making holiday crafts inspired us to create the Merry Little Christmas 36 inch Table Runner. 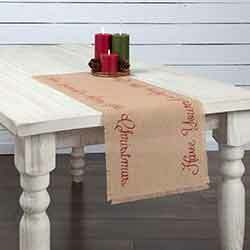 The Merry Little Christmas Jute 36 inch Table Runner is a well of good wishes and holiday blessings. On both horizontal lengths, Have Yourself a Merry Little Christmas is stenciled in an elegant red script font on natural jute. The Middletown Check Black Collection features an open windowpane check pattern of oat and black (NOT white). This is for the Tablerunner, which is chindi/rag rug style, and has fringe on 2 ends. Mr. Winterberry Tablerunner, by Raghu. 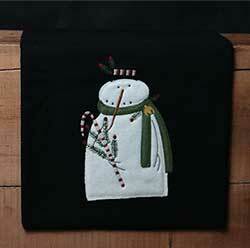 100% wool in black wool and cotton applique/embroidery of a snowman and candy cane Measures 14 x 36 inches. Perfect for that country primitive Christmas! Multi Star Navy Tablerunner, by Victorian Heart. The Multi Star Navy Collection features a classic creme star pattern stenciled on navy blue denim-like cotton, which is then distress-washed for a vintage feel. This is for the 36 inch Tablerunner. Has distressed edges. Measures 13 x 36 inches. 100% cotton. Other items also available. Also comes in Red! 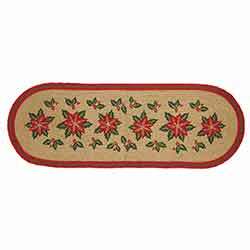 Multi Star Red Table Runner, by Nancy's Nook. The Multi Star Red Collection features a classic creme star pattern stenciled on distressed red enzyme washed cotton with a vintage feel. This is for the Table Runner in the 36 inch size. This primitive holiday runner features snowman and tree embroidery on a tea-dyed cotton background. Not a quilted style - this is just simple, finished, embroidered fabric style, easy to set decorations atop without them wobbling because of thick batting, and drapes nicely over the edge of a shelf or table. Natural Braided Table Runner, 36 inch, by Nancys Nook. 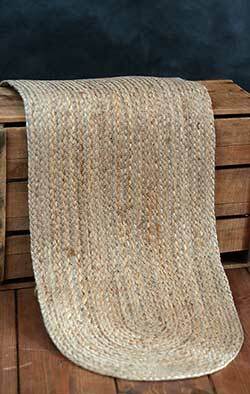 Natural Jute Runner adds a simple and easy decorative element to any table with braided jute. Dress up any setting with the added bonus of its efficient functionality for hot food presentations. Navy Star Table Runner, by Nancy's Nook. The Navy Star Collection features a classic primitive checked pattern of Navy Blue and TAN, with appliqued star(s) in solid navy blue. This is for the Tablerunner in the 36 inch length. Scalloped edges, appliqued stars along each edge. Measures approx 13 x 36 inches. 100% cotton. Matching table linens, window treatments, and more also available! 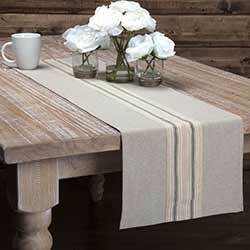 The Neve 36 inch Table Runner showcases a modern vintage design that strikes a balance between grace and ruggedness. Neve weaves creme burlap with silver metallic thread for a shimmery finish. Reverses to beige and pearl acrylic. New Port Stripe Tablerunner, by Raghu. The New Port Collection features a black stripe against an oat-colored background. This is for the Tablerunner. Measures approx 14 x 36 inches. Made of 100% cotton, ribbed style with small fringe at each end. Other items in collection also available! 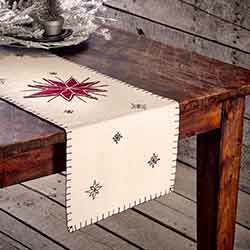 Inspired by the symbolism and significance of the brightest star in the sky, we created the North Star 36 inch Table Runner. The thick whip stitching of the Nowell Creme 36 inch Table Runner adds glitz to the creme burlap and silver metallic thread to create a radiant finish. The Nowell runner is a great addition to the country Christmas table. 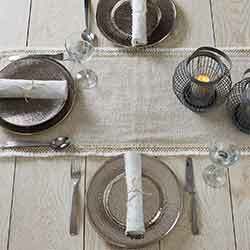 The thick whip stitching of the Nowell Natural 36 inch Table Runner adds glitz to the natural burlap and silver metallic thread to create a radiant finish. The Nowell runner is a great addition to the country Christmas table. Olive, Burgundy, & Gray Jute Tablerunner, by Capitol Earth Rugs. Jute is a natural fiber, considered to be a sustainable, environmentally friendly material. Water repellent, safe to put near a fireplace, spot clean with soap and water (or dry clean). This is for the Tablerunner, in the Olive, Burgundy, & Gray color. Measures approx 13 x 36 inches. Olive, Burgundy, Gray Tri-Circle Table Runner, by Capitol Earth Rugs. Pretty braiding in olive green, burgundy, and soft gray. Measures 15 x 36 inches. Made of 100% natural dyed/printed jute fiber. Original Flag Braided Jute Table Runner, by Capitol Earth Rugs. Features stenciled flag image, in red white and blue. Measures 13 x 36 inches. Jute is a natural fiber, considered to be a sustainable, environmentally friendly material. 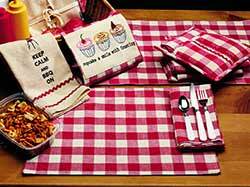 Brighten your country home in cheerful picnic checks, with this red and white checkered table runner. Measures 13 x 36 inches. Pine Tree Wishes Tablerunner, by Raghu. 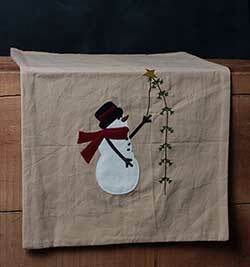 Tea dyed tan cotton runner with wool and cotton applique/embroidery of a snowman putting a star atop a feather tree. Measures 14 x 36 inches. Perfect for that country primitive Christmas! Pinecone Braided Jute Tablerunner, by Capitol Earth Rugs. Features stenciling of pine cones and sprigs in forest greens against a natural jute colored background. Measures 13 x 36 inches. Made of jute, which is a natural fiber, considered to be a sustainable, environmentally friendly material. Water repellent, safe to put near a fireplace, spot clean with soap and water (or dry clean). Potomac Braided Stair Tread with Stars, by VHC Brands. 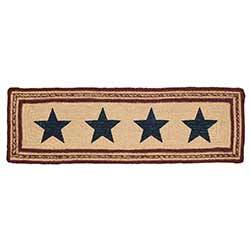 The Potomac Jute Collection features braiding in burgundy and natural jute, with navy stenciled stars. Potomac Braided Stair Tread with Stars, by VHC Brands. 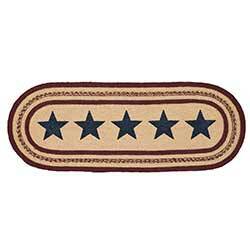 The Potomac Jute Collection features braiding in burgundy and natural jute, with navy stenciled stars. This is the RECTANGLE tread. 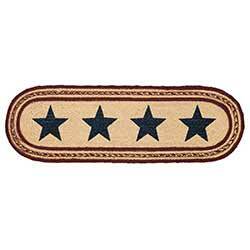 Potomac Braided 36 inch Table Runner with Stars, by VHC Brands. 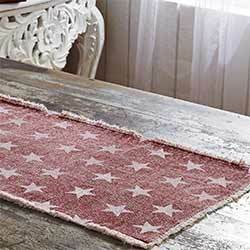 The Potomac Jute Collection features braiding in burgundy and natural jute, with navy stenciled stars. This runner is approx 13 x 36 inches. 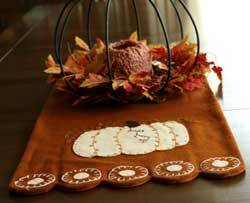 Prancer Table Runner, by Nancy's Nook. Made with 100% cotton chambray in tan, with dark brown whip-stitch binding around the edge, and reindeer and snowflakes stenciled in brown. Measures approx 13 x 36 inches. Providence Plaid Runner, by Raghu. 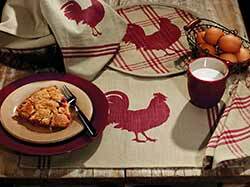 The Providence Plaid Collection features a large plaid pattern of barn red, oat, and black. This is for the Tablerunner, which is woven rag/chindi style, and has fringe on 2 ends. Measures approx 14 x 36 inches. 100% cotton. 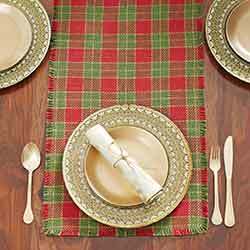 With large checks of ruby, evergreen, and natural plaid, the Reed 36 inch Table Runner is an elegant addition to the table any time of year. 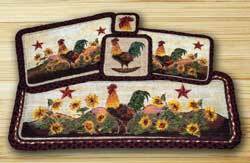 Features a rooster applique with burlap accents on a cotton runner with a black and light tan gingham check pattern. 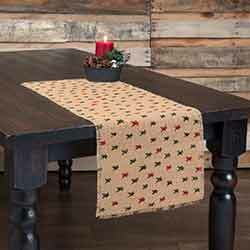 Nothing says Home for Christmas like a house whose table is adorned with the Robert 36 inch Table Runner. 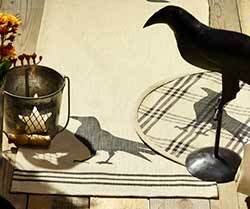 Robins Nest Braided Table Runner, by Capitol Earth Rugs. Features stenciled artwork in the center of a pretty spring bird's nest with robin eggs. Measures 13 x 36 inches. 100% natural jute, dyed and braided. Artwork designed by Diane Kwasnik. Salem Check Black Tablerunner, by Raghu. 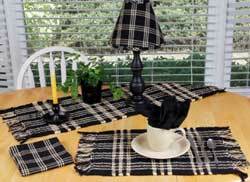 The Salem Check Black Collection features windowpane check pattern of black against a cream background. This is for the Tablerunner. Measures approx 14 x 36 inches. Made of 100% cotton, ribbed style with small fringe at each end. Other items in collection also available! Bring a fresh farmhouse look to your dining room with the Sawyer Mill collection. This is for the 36 inch Table Runner.